This post by Tara-Nicholle Nelson originally appeared on the Trulia Pro Blog, a blog for real estate professionals on Trulia.com. Follow Trulia Pro on Twitter: @TruliaPro. And this is particularly true with real estate and putting your listings on the market — because homes, locations, aesthetics and such are so much a matter of personal preference, some people will find something to criticize about even the most perfectly staged, priciest properties on the market. As a listing agent, your job is not to try to make your listings be all things to all people — but you do want it to appeal to enough buyers that you get one great offer (and multiple offers never hurt anybody, either). That said, you don’t want your listing to be the house that nearly every buyer and broker sees, rolls their eyes at and utters the same few, predictable, deal-killing criticisms. Fortunately, what is predictable is avoidable. Unfortunately, many of the things that make a listing susceptible to haters are issues on the seller’s side of the property preparation responsibilities. 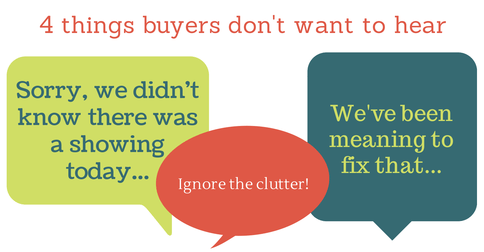 Let’s explore the most common things buyers hate about listings they see. In the process, you’ll get equipped with things you can say to your sellers to help sidestep those issues and, in large part, hater-proof your own listing. (b) Consider whether this listing makes sense to take in the first place. Also, consider using your broker’s first open house as an additional hater-proof measure: If the agents overwhelmingly comment that they think the home is significantly overpriced, communicate this feedback to your seller. That’s all fantastic — all the noncosmetic work that’s been done to maintain and improve your listing should be trumpeted in your marketing materials, and the cosmetic items will (or should) speak for themselves. But here’s the thing: House hunters won’t be running the dishwasher or testing the furnace (at least not until inspections).